Lots of information to digest in this new ordinance, some highlights as we see it; no parking minimums downtown, parking maximums in designated transit oriented development areas, special provisions for neighborhood commercial in residential areas, changes on Broadway to the Residential-Professional zone to allow more neighborhood commercial by right. The zoning is a critical tool to implementing the city’s goals for smart, sustainable, equitable and transit-oriented development; it implements the vision of the city’s Comprehensive Plan and other policy adopted in 2012, and is the result of extensive public input – including 10 neighborhood plans – from 2005 through 2012. The new Ordinance provides a clear framework for guiding growth and was one of the Mayor’s major initiatives in his 20-point plan, Putting Providence Back to Work, released in March 2013. The document is the result of a 1 ½ year collaboration made possible by a HUD Community Challenge Planning grant, through its office of Sustainable Housing and Communities. The city hired Camiros, an award-winning consulting firm with national zoning experience, to help write the new Ordinance. The City Plan Commission voted unanimously on August 19, 2014 to recommend the City Council approve the new Ordinance. It was subsequently approved at the November 6 and 20 meetings of the Council. The new Ordinance includes revisions to existing Ordinance including district standards, use permissions, processes, and development standards. It streamlines the development process. It allows for high-quality mixed use development where appropriate and helps better preserve, strengthen and protect the historic pattern of development central to the character of the city. 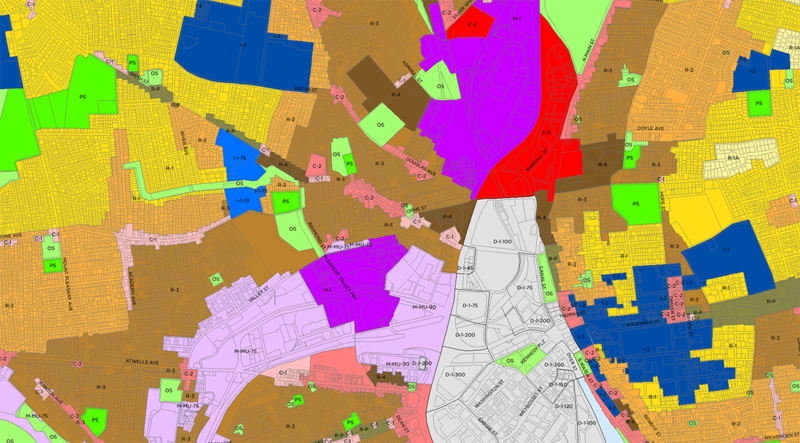 It also includes many changes to the Zoning Map, such as geographic boundaries of current zoning districts, consolidation of existing districts and creation of new ones. Examples include: a new R-1A district in the Blackstone area to prevent subdivision of large residential lots; General Residence and Multi-Family resident replaced by one R4 district to consolidate medium & high density into one simplified zone; consistent standards for major C1/C2 commercial corridors; new transit-oriented development (TOD) to encourage more intensive development on portions of major transit routes of North Main and Broad Streets. It also includes a new Landmark Historic District expanding the current non-contiguous Industrial Commercial Buildings District with voluntary inclusion of residential or institutional properties based on National Register or other criteria; expanded uses in W3Waterfront zone ensuring that LPG as with other fuels is an allowable use for storage and distribution, facilitating current industrial expansion as a long term use. How come there’s parking minimums outside of downtown? What’s the harm of not having parking minimums? It is mostly political. People (voters, people who donate to campaigns) who already live here panic about other people coming and where will they park. The reality is they will either park on the street, which is why we passed an on-street parking ordinance*, or the developers will build parking they think they need, no minimums doesn’t mean no parking. If developers think that they cannot sell or rent units without parking, they’ll build in the parking they think they’ll need. Or, gasp, people might not actually have cars. The overnight parking also panics people because they think they own the spaces in front of their house, and drug dealers might park on the street (people really worry about this). I take less issue with the ordinance than the map. Providence has essentially zoned the city on a property-by-property basis. Look at all of the individual parcel enclaves with their own zones, surrounded by other uses. Its classic caving to developers and NIMBY interests. I see very little about this that will create a vibrant urban environment. There’s the two zones aimed at hemming in RI Hospital and Brown to the point that they aren’t able to compete regionally, let alone globally. Should Providence be a city of one and two-family homes? Because that is what this looks like on the map. It fails to create a vision for an urban metropolis. If you look at the ordinance, minimum lots are 5,000 SF and maximum lot coverage in residences is 45%. This is prescribing surburbia, not urban living. Hey I was just wondering how would a find a zoning map, since I live on Atwells ave. In Providence I don’t have a parking space and would like to find out where I could leave my car overnight. Information on overnight parking can be found at https://www.providenceri.com/overnight-parking. Atwells crosses districts 4 (Federal Hill) and 5 (Olneyville/Valley/Mount Pleasant) if you look at the district maps. If you’re looking for off-street parking, you should inquire with your landlord who might know where there are lots that rent spaces. If you don’t rent, ask your neighbors if they know of any lots that rent spaces and who to call.